But maybe like me, you’re tired of waiting yet unwilling to throw it all out and start over again. If so, I propose a third option, a process for creating movement that emanates from within. This movement may be quite different from what you’re used to. It’s not a tumultuous and churning kind, filled with peaks and valleys, thrashing you about like a tempest or taking you for an uncertain ride. This movement is controlled and steady- a gentle current that propels you forward while protecting you from the wild waters that rage beyond. I look forward to sharing my unique approach to MOVEment through upcoming posts, presentations, and workshops. I’ve always felt strongly about names. A good name can provide you with a sense of history, direction and character. It grounds you while at the same time giving you wings. My name- Mara- means many things. As a child I first learned of its Hebrew meaning, “bitter.” My Mother liked to tell me that the local Rabbi had tried to persuade her to choose a better name, even offering Miriam as a more suitable alternative. He said that Mara was no name for the promise of a Jewish baby, but my mother had been adamant, and Mara I was. Over the years I have searched for other more nuanced meanings of my name, hoping for something slightly more positive or inspiring. But somehow I always got stuck with the Biblical translation; that is, until I met the Sisters. The moment I introduced myself things got weird. “Hi, I’m Mara,” I said. They had looked at me with interest, asking me to spell my name- M. A. R. A. “What do you do?”- it was a seemingly innocent question posed with expectant eyes. I overflowed with enthusiasm, describing my then position at the University at Buffalo, brokering partnerships with area schools, working to support the promise of education. Time stopped and the air grew fuzzy. Why were they staring at me? I could feel the weight of coincidence before it was revealed. They had traveled from the Mara Region of Tanzania- spelled and pronounced exactly the same- and were seeking partners to help them build a school for girls. Honestly, what were the odds? It was Christmas day and the two nuns- Sister Janepha and Sister Agnes were last minute guests at my mother-in-law’s. They explained that in rural Tanzania, where 80% of the population live, girls are traded into marriage at an early age, left to endure lives of suffering and hardship with no hope of upward mobility. There, like in our own country, education is the only pathway to prosperity- but because there is not enough money, girls are forced to marry, as families look to their boys to invest their precious resources and hopes for the future. By the end of their visit the Sisters had asked me to help them, or at least that’s what I recall. As a mother of four young children (3 girls and 1 boy), their vision represented everything I believed in and was working towards. And how could I ignore the significance of the name? I’m still not sure what to make of this story. I have never been what you would call a religious person- or a fatalist- but it’s hard to deny the significance of our initial meeting or all that has since transpired. So many gifts have been given and received since that Christmas day six years ago. And there are so many stories yet to be told. I know from my travels that time in Tanzania is thought of quite differently than it is here. There, time is said to be elastic, meaning that it stretches and changes with the rhythms and demands of life. In Tanzania things take as long as they take. Movement is not forced or imposed but crawls forward on its own accord, little by little -or as they say, “pole pole”). As a person who has always been terribly impatient, trying to peek ahead and force movement at every turn, this discovery about my name still makes me giggle. 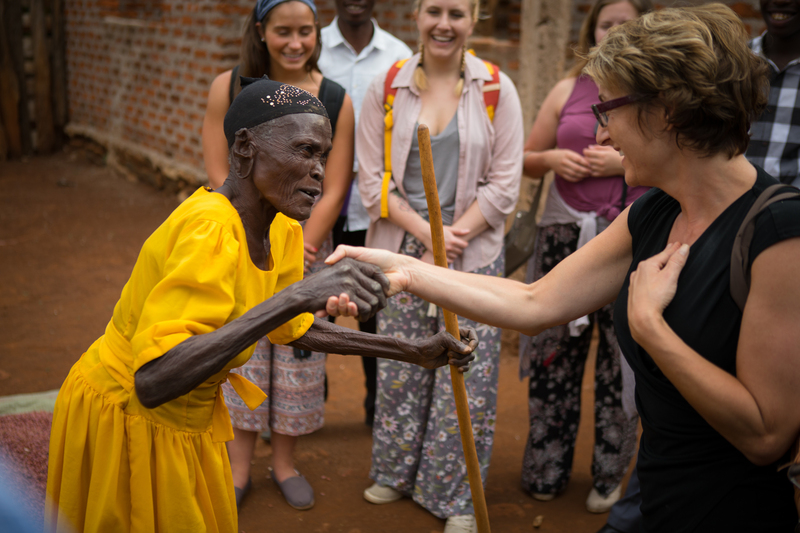 Since meeting the Sisters (Immaculate Heart Sistes of Africa), and helping to start ourTanzania project I have had many more “chance” encounters with amazing people who continue to enrich my life in so many ways. And so on this Thanksgiving weekend as I count my many blessings I would like to thank those of you who have been part of the BTEP journey …. and my parents for giving me such a wonderful name…. When it comes to coaching and facilitation I am a huge fan of self-reflection and visioning exercises. I like to think that I have a few good ones in my tool-kit but recently added a new favorite, compliments of my six-year old Natalie. As Natalie was describing the world in her head I was taken by the insights that her narrative revealed. The notion of dreaming has long been seen as a window into the mind, and a place to map out one’s hopes, fears, and aspirations. And perhaps as we’re dreaming we should all take a brief visit to Natalie’s world to be showered with confetti, welcomed as a hero, and cautioned to avoid the Door of Greatness…..
An invitation to join a board can feel like a validation. By giving you a nod, the other members are in essence endorsing your skills, respecting your resources, and inviting you to play in their inner circle. For young professionals the promise of board service can seem especially appealing, opening the door to important business connections and starting a new category of accomplishments for your resume. And of course when the non-profit has a mission or target population that speaks directly to your passions, it’s hard to be anything but enthused about the prospect of stewardship. Despite the build-up, however, many of us have experienced the frustration and disappointment that can come with board governance. Instead of helping a population or stewarding a mission, we often find ourselves shuffling reports or patching holes with never-ending checks and fundraisers. Because incoming dollars and grants are easier to track than more intangible outcomes related to community needs and impact, an inadvertent emphasis on fundraising and grant writing can emerge. When funding and fiscal health become accepted proxies for organizational success, the board can be lulled into a false state of confidence. Paradoxically, organizations that become increasingly complex are often less nimble and able to adapt to a changing environment. And as the challenges facing our marginalized communities become more deep and complex, the vary organizations that we are relying on to serve them become equally unstable. When one accepts this inherent state of instability the implications for board stewardship suggest some weighty questions. Does the need for community support justify the perpetuation of instable non-profit models? Does the fact that long standing community organizations have existed suggest that they should continue to exist? And by inviting in leaders who have the resources to sustain and perpetuate these organizations, how will we ever break the cycle and create leaner and more nimble approaches? Logically, the only way out of this dilemma is to hold boards and their directors to a new set of standards, and to employ a series of clarifying questions to reveal areas of concern and needed change. Is the organization necessary within its respective community? Are there other organizations that occupy a similar space? Does and can collaboration happen to increase efficiencies and strengthen service for that population? Is there a better and/or smarter way to deliver the services? From an operations standpoint we must look at whether the population and its respective needs are at the center of the model, with clearly defined commitments that can be met regardless of a changing landscape. Is the organization run with maximal simplicity, transparency and self-sustainability? And does it maximizes human capital, volunteerism, and in-kind resources to the fullest extent? These and related questions will become increasingly important if we aspire to get more out of our non-profit organizations as solutions for our growing community challenges. We will need support for existing boards to grapple with these complexities and make the necessary modifications to increase stability and impact. But we will also need to attract new board members with the skills and competencies necessary to steward this considerable paradigm shift. We will need directors who are creative and entrepreneurial, able to hold organizations accountable and pull the plug if necessary. Holding ourselves and our community boards to this new level of standard will not be easy, and will require significant support. But the alternative is unacceptable. If we fail to make the necessary changes and simply continue to perpetuate community organizations as they exist, the only thing that we will be stewarding is the their obsolescence. My daughter Elena has always been one to combat the establishment- and my parenting, but the education system continues to feed her ammunition…. I of course proceeded to clarify my expectations for cleanliness with a few choice words thrown in. But Elena’s response was more than simple insubordination- it was symptomatic of our hyper-focus on assessment and the impact that it is having on our children. The idea that every assignment or responsibility needs to be unpacked into component tasks, metrics, and repercussions before a child can be expected to complete them, is a slippery slope to say the least. In addition to removing a sense of internal responsibility for assessing mastery or acceptable standards, it also negates opportunities for decision making, perspective taking, and metacognitive adjustments that are so critical to success. Taken to the extreme an over-reliance on metrics and rubrics can weaken one’s internal compass and foster dependence on external measures and expectations. To be clear I am by no means blaming my daughter’s boldness on rubrics, nor am I suggesting that assessment has no place in education. I am, however, cautioning that developing our internal metrics for “good enough” is perhaps even more important than our need for clarity and high test scores….. Although the notion of a seamless education pipeline is inherently appealing, it remains a metaphor far removed from reality. The idea that the simple tightening of connections between PreK-12 and higher education will yield a continuous flow of preparation is a gross oversimplification at best. While important, public education and colleges/universities are joined by other entities such as federal and state departments of education; teachers unions; and teacher preparation programs that contribute to the overall drippiness of our current education system. These units and others that provide resources, policies, or expectations related to education must also be sealed together. But before we reach for the proverbial soldering gun, we need to make sure that all the pieces are in the right order. By extending the pipeline to include workforce development it shifts our collective focus to the notion of “workforce readiness” and behooves us to identify the skills and dispositions that are critical for students, graduates, and employees. Clearly to be competitive in the global economy we need graduates who are innovators, problem solvers, and thinkers; men and women who can address the complex challenges and opportunities that continue to emerge and evolve within our communities- local, national, and abroad. Clarifying these dispositions and skill sets may be just what we need to reconfigure our education pipeline in a manner that will prepare our students for success- not by magic or exception, but by design. Once our expectations are operationalized we can begin the task of working backwards to align and tighten. If we are serious about strengthening our economic competitiveness, workforce development must be front and center as we examine job trends and accompanying educational profiles, and push these expectations down through higher education and PreK-12 curricula. In addition to traditional knowledge competencies we must also create opportunities for the development of soft skills including critical thinking, interpersonal communication, and metacognitive strategies that will allow students to contribute as active participants in our evolving economy. And while we are tackling the curriculum it is also imperative that we align teacher preparation programs to ensure the development of teachers who are able to cultivate these dispositions and competencies- for we simply cannot prepare students without teachers who are prepared themselves. Is it really possible to reconfigure a pipeline that is so complex and antiquated? Absolutely, and it is through this alignment ONLY that the system can operate efficiently and be evaluated in a meaningful way. But clearly, the system cannot overhaul itself. Regardless of their best intentions, the individual pipes lack the power to transcend their respective missions and goals. A job of this scale requires an architect who while knowledgeable about all components, maintains a clear and unyielding focus on the final vision. It also calls for a team of expert technicians who can map backwards from the endpoint, aligning and tightening as they go. Clearly this task of retrofitting our entire education system is a daunting one. And understandably many may be more comfortable continuing with the status quo. But if this is the route that our country continues to take with regard to education, then our only hope- at the risk of taking the plumbing metaphor too far- is to invest in a serious pair of waders. At the risk of sounding cynical, I think we’ve had our fill of great ideas in education. What we need now is more process people. Who are process people? We are the ones who can take a vision – be it extraordinary or mediocre- and breathe it to life. We can frame and reframe ideas, drilling down to goals and objectives, feeling our way forward and creating movement. Simply put, we set ideas into motion. In our current climate of polarized perspectives and agendas, ideas and visions are no longer enough. We need skilled facilitators who can move them forward, navigating threats and obstacles toward meaningful outcomes. Clearly, process people are more critical than ever and luckily we are not hard to find. We exist in virtually every field and discipline just waiting, yearning for our skills to be utilized, yearning for a chance to make things happen. But creating spaces for our work is not easy. Often the leaders who need us most are unaware of their own limitations or the value and possibilities associated with our skillsets. In some ways we are our own worst advocates. For when we are at our best, our respective organizations and systems work more smoothly with little awareness of our contributions or the work that we do behind the scenes. Perhaps it is time to bring our actions into the foreground and clarify their value in relation to core goals and priorities. By professionalizing this category of “process” we could potentially work to create more opportunities to add value and learn from oneanother, while offering support and mentoring to those who feel the calling…. Do you ever tire of individuals and organizations pretending to have it all figured out, insisting that their models are superior and worthy of support and adoration? Just once I’d love to attend a conference featuring best failures instead of best practices. Imagine esteemed leaders standing before their peers, sharing stories about hitting the wall and facing structural challenges that threatened their success. Imagine the rich dialog and reflection that could result as participants considered their own experiences, with spin-off committees and action groups exploring new models and paradigms. As the challenges facing our communities grow deeper and more complex it’s time to admit that our current models and approaches are not working and that we do not, in fact, have it all figured out. With that said, it would be a waste to dismiss our failures in all their richness. It is only by exploring them openly and thoughtfully that we can clarify the points of leverage and fragility that are key to finding our path forward. I will be presenting “Emerging From the Middle” at the December 5th TEDx Buffalo Women event. Check out all of the fascinating speakers and follow my talk on Live Stream.